Thomas Homan, deputy director of the U.S. Immigration and Customs Enforcement, called out California's top Democratic leaders for accusing federal law enforcement officers of unfair, traumatizing treatment of illegal immigrants in their state. Homan said he wanted to set the record straight one day ahead of President Trump's first trip to California amid a battle between the administration and the state, the sanctuary laws of which strictly limit communication between local and federal authorities. 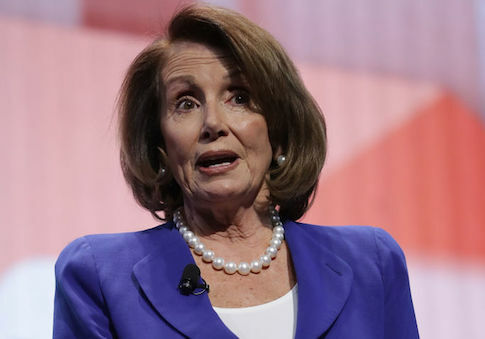 Minority Leader Nancy Pelosi (D., Calif.) last week slammed as "unjust and cruel" recent ICE raids on illegal immigrants in California that resulted in the government detaining hundreds of criminals, many with convictions for violent crimes. She also pledged to "fight this sham lawsuit" and "all cowardly attacks on our immigrant communities." Homan called Pelosi's comments "beyond the pale," and repeatedly asserted that ICE does not arrest innocent people. "I want to remind everybody that the L.A. operation we did last month, 88 percent of the people we arrested were convicted criminals," he told reporters on a conference call Monday night. In all of 2017, 81 percent of the illegal immigrants arrested in California were convicted criminals, he said. "As far as her quote about terrorizing immigrant communities—law enforcement officers that enforce federal law—laws enacted by Congress, how dare she say we are terrorizing immigrant communities," he said. Instead, Homan argued that the people terrorizing immigrant communities are the criminals in their midst. The most recent raid in the Bay area resulted in ICE arresting four people who had been previously arrested for aggravated assault with a deadly weapon, five people convicted of carrying concealed weapons, four people who were arrested for cruelty toward a child, two who were arrested for cruelty toward their wives, six people convicted of domestic violence, one person who had been convicted of drug trafficking, and one person who was convicted for lewd and lascivious acts with a minor, Homan said. "To call what we do cowardly acts on the immigrant community, to talk about law enforcement officers who wake up every day leaving the safety and security of their homes and their families and strap a gun to their hip every day to defend this nation, that's the farthest thing from cowardly you're ever going to see." He also had sharp words for Sen. Dianne Feinstein (D., Calif.), who recently accused the Trump administration of attacking California to score points with the president's base. Congress passed the laws deciding exactly how ICE operates, he said, and "if they don't like it, Nancy Pelosi and Dianne Feinstein can certainly change the law." Homan said Feinstein voted for a 1996 immigration law that gave ICE greater power to arrest and deport illegal immigrants accused of committing minor offenses such as shoplifting. Before 1996, immigration deportation was only allowed for people accused of committing offenses that could lead to five years or more in jail. Homan also said the sanctuary state law has forced some California law enforcement officers to pull out of anti-drug and anti-smuggling task forces. Other administration officials, who requested anonymity, argued that sanctuary cities are serving as magnets that help smugglers entice people to make the often-generous trip north who are often the same smugglers working with violent drug cartels to push drugs into the United States as well. "We're bankrolling them with these sanctuary policies," the official said. The senior official defended the raids on California employers, arguing that ICE officials could simply go to the jails and pick up wanted illegal immigrants, but because of the sanctuary law, must now go out into the communities to find them. California last year passed three sanctuary laws that severely limit local law enforcement's ability to communicate with federal authorities and hold illegal immigrants so ICE can pick them up and potentially proceed with deportation. The measures also prohibit businesses from cooperating with ICE and prevent federal authorities from conducting operations at public buildings, such as schools or hospitals. The Justice Department sued the state of California last week over its sanctuary law, arguing that only the federal government has constitutional authority over the country's immigration policies. Administration officials clarified that they haven't arrested anyone at a church, hospital, or school ground. There also said that ICE does not conduct arbitrary sweeps of neighborhoods, but only targets homes and employers of illegal immigrants they have been tracking for months.